I was never an expert of lambda-calculus, but I always wanted to learn (at least the basics of) it. So, I decided to write a very simplistic interpreter for the untyped lambda calculus. Abbreviations/macros, so that the user does not need to input too many things at once. Step-by-step evaluation of lambda expressions. Language of choice: Haskell (using Parsec to parse user input). 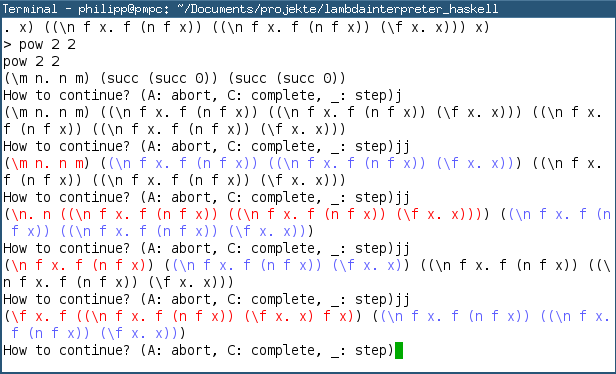 As you can see, the program supports colors for specific parts of a lambda expression. A beta-reduction that's going to take place in the next step is displayed such that the function that is applied is displayed in red, while the argument is printed blue. While this makes pattern matching more cumbersome in many places, it gives more freedom in other contexts: Different reduction strategies can be implemented in a more general manner and we do not have to update the color-printing routine for each reduction strategy: We simply set the corresponding flags (the ones that shall be reduced in the next step), pretty-print the expression and apply the reductions. I also installed some smart constructors that automatically create abstractions or applications with the flag set to False. From now on, we will also call these flags tags. If we have an application whose first part is an abstraction, we will be able to perform a beta reduction. If we have an application whose first part is not an abstraction, we check whether its first component is beta-reducible. If so, we install the proper tags in the first subexpression and leave the second as it is. If not, we install possible tags in the second subexpression. If we have an abstraction, we have to compute the tags within the body of the abstraction. If we have something else (i.e. a variable), we simply return it as it is. The case distinction in betaReducible is structured similar. Application True _ y -> error "Disallowed tagged application." Abstraction True x _ -> error "Disallowed tagged abstraction." Again, we have simple case distinctions, but now incorporating the value of the tag so that we can determine whether the current subterm shall be reduced or not. Note that this does not include "nested" reductions. I.e. if we set the tag for a beta reduction, we won't set any tags for its two subexpressions. The full code is hosted over there at github.